Since 1913, Prada has been synonymous with cutting-edge style. Its intellectual universe combines concept, structure and image through codes that go beyond trends. Its fashion transcends products, translating concepts into a universe that has become a benchmark to those who dare to challenge conventions by focusing on experimentation. Prada has always been a brand to capture an individual’s self-expression. 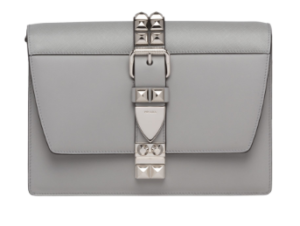 The bold but elegant Prada Elektra calf leather bag has a sleek silhouette. With a narrow width and flap, it is defined by the flat and pyramid-shaped studs decorating the detachable shoulder strap and front buckle. With the Chiffon Blouse with Feathers, Prada captures modernity and sophistication. 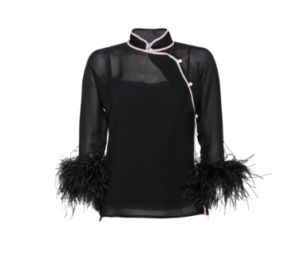 This elegant silk chiffon blouse with oriental charm is defined by contrasting piping, asymmetrical button closure, and feathers applied by hand on the cuffs. The sunglasses Prada Game Eyewear exemplify style and charm. These oversized, square frames capture a contemporary appeal with their flat, rimless lenses and Prada logo on the sides. These sunglasses capture the modern look of Prada. The online USA Prada store has by far the largest range of Hermès products in the world. The USA Prada online store unfortunately does not offer international shipping. Not to worry though! Big Apple Buddy, your personal shopper, can help you buy products from the USA Prada online store and ship them to your doorstep, no matter where you are in the world. We offer international shipping to over 110 countries including Australia, Austria, Azerbaijan, Bahrain, Belgium, British Virgin Islands, Brunei, Bulgaria, Canada, Chile, Costa Rica, Croatia, Czech Republic, Denmark, Estonia, Fiji, Finland, France, French Polynesia, Germany, Gibraltar, Greece, Greenland, Hong Kong, Hungary, Iceland, Indonesia, Ireland, Israel, Italy, Japan, Jordan, Kuwait, Latvia, Liechtenstein, Lithuania, Luxembourg, Macau, Malaysia, Maldives, Malta, Marshall Islands, Mauritius, Monaco, the Netherlands, Netherland Antilles, New Zealand, Norway, Oman, Poland, Qatar, Romania, San Marino, Saudi Arabia, Serbia and Montenegro, Seychelles, Singapore, Slovak Republic, Slovenia, Spain, South Africa, St. Lucia, Sweden, Switzerland, Taiwan, Thailand, the UAE, the UK, Vatican City, and Vietnam. If you would like to buy from the USA Prada online store, simply let us know which items you would like to order (by filling out the form below) and we’ll get back to you with a free international shipping quote within 24 hours!